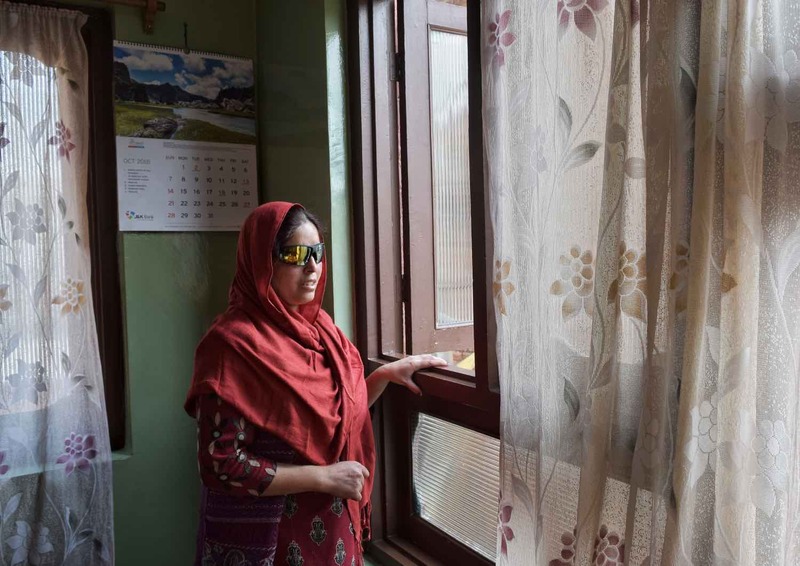 In yet another gun battle aftermath, Nusrat Jan, a 32-year-old mother of a two-year-old baby lost her eyesight when a pellet fired by Indian armed forces pierced her right eye following intense clashes near the gunfight site at Fateh Kadal area of old Srinagar on 17th October, 2018. Here, a photojournalist from Srinagar details the young mother’s post-pellet-assault phase, in words and visuals. All her life, Nusrat would impatiently wait for winter, for a glimpse of the season’s first snowfall. But little did she know that her 32nd winter would no longer hold that excitement. With one blinded eye, she slouches on her bed, instead of going to the window to watch the early snowfall that graced Kashmir this year. On the morning of October 17, Nusrat had woken up to rattling gunshots in her neighbourhood. That day, in Old City’s Fateh Kadal, two local militants—Mehraj Ud Din Bangroo and Faid Waza—along with a counterinsurgent, were killed in gun battle. Soon, as violent clashes broke out between Indian armed forces and Kashmiri civilian in the area, forces used tear-gas canisters and pellet guns on the protesters. Amid loud bangs and growing street commotion, Nusrat was caressing her daughter, Madiha, at her home which is just a few metres away from the gutted gunfight site. To stop the smoke from entering into the room, the young mother went to close the only open window of her room. “As soon as I tried to close it, a pellet shot fired by the armed forces penetrated through the window curtain and hit my right eye,” Nusrat stammers, shuddering with reminiscence. “I felt as if my right eye had ruptured. Streams of blood start flowing from my eye. I tried to stop the flow of blood with my hands but failed. I couldn’t witness the tragedy and fainted,” she continues, anxiously. Nusrat was immediately rushed to the nearest Shri Maharaja Hari Singh hospital (SMHS) for treatment where she had to undergo a surgery. The use of ‘non-lethal pellet guns’ by the state forces as a part of riot-control has already wounded, blinded and killed scores of people in Kashmir Valley. Over, 6,221 persons have received pellet gun injuries between July 2016 to February 2017, and out of them 782 had eye injuries. As per State Human Rights Commission (SHRC), 59 women were hit by pellets, targeted inside their homes. As Nusrat continues to sigh over the sudden torment, her pellet-induced disturbed mindset is now making her restless. And in that state of suffering, she seems to have lost the meaning of small joys in life — like the watching the snow fall. The neighborhood man takes a look inside the destructed house that was ravaged during a gunfight at Fateh Kadal area of old Srinagar. Nusrat stands near the window where she got hit by the pellets fired by the armed forces. Violent clashes erupted between government forces and protesters near the encounter site. 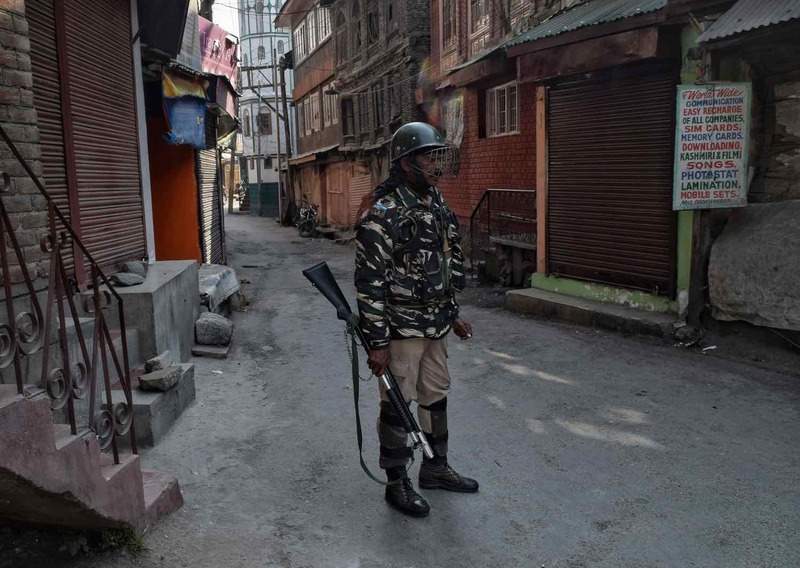 A CRPF personnel stands guard while holding a pellet gun at a residential area during a shutdown in old Srinagar. “The pellet injury left a void in my heart. Now; I can see my daughter only through my left eye”, says Nusrat. Nusrat’s husband puts medicinal drops in her eyes. Nusrat with her two year old daughter Madiha. Nusrat in agony when it crosses the boundaries of her strength. 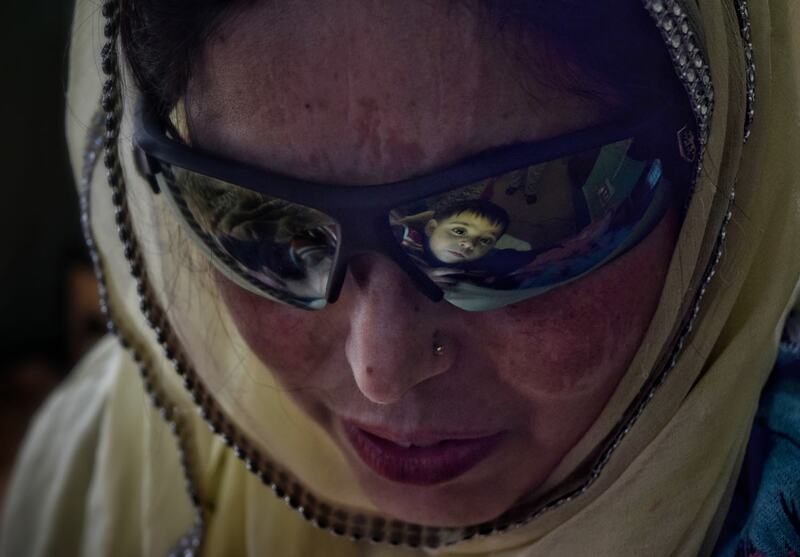 Madiha lost the warm cradle of her partially blinded mother, Nusrat. Jo maang rahe hai Azadi our soldiers are committed not give them Azadi…Pellet guns are used to bring the people who are in darkness and try to bring the nation in darkness.. According to your own numbers around 700 people recieved eye injurys from pellets yet you separate people and say around 50 got hit from pellets. That mean men are victim of around 600 pellets attacks. They are 12 times more likely to be hit. So why are you saying in particular how many women were hit? You would think you would want to show what group was the biggest victims of this issues….guess journalistic integrity is not a thing anywhere around the world today.